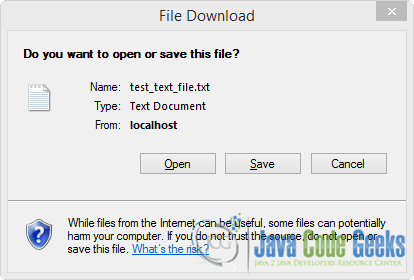 In this example we are going to see how you can download a file from a JAX-RS REST Service. It’s significantly easy to do that, as it requires to annotate the bind method with the @Produces annotation. The @Produces annotation can used to used to specify the MIME media types a service can produce and send to the client. In this example we are going to see how you can download text, image, PDF and excel files. The second thing to note is that you have to attach the file to the response and then set the Content-Disposition header variable of the response. The Content-Disposition response-header field is used to dictate a a default file name if the user requests that the content is saved to a file. A simple example would be : Content-Disposition: attachment; filename="fname.ext". Using this, the user-agent will not display the response, but directly the pop up “Save as…” dialogue. In this example we are not going to focus on how to create JAX-RS application from top to bottom. 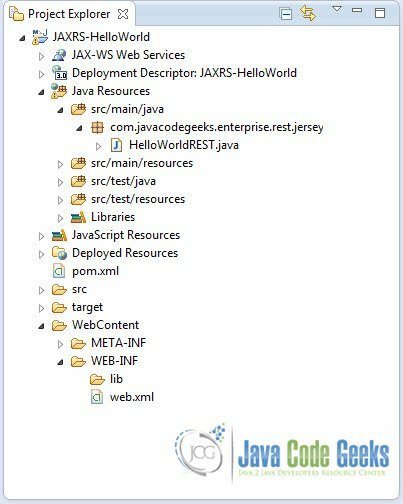 So make sure you read carefully Jersey Hello World Example and RESTEasy Hello World Example, and pay attention to the sections concerning the creation of the project with Eclipse IDE as well as the deployment of the project in Tomcat. 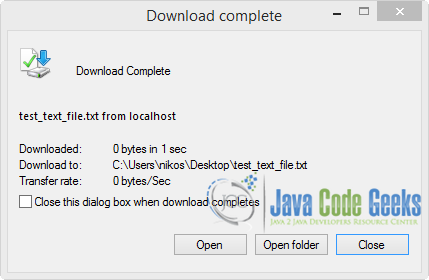 The code presented in this new tutorial will only concern HelloWorldREST.java file. If you have specified a default folder for your downloads in your browser, the file will be automatically downloaded without any dialogue boxes (in most cases). To download different file formats all you have to do is change the type registered in @Produces annotation. @Produces("image/png") for images (you can change the “png” part according to the format of the image). 166,176 insiders are already enjoying weekly updates and complimentary whitepapers!